Our ornately decorated Good Luck Elephant Candle Holders are sure to add some interest and pizzazz to your next special event! The elephant is symbolic of happiness, strength and longevity making them the perfect, thoughtful gift for your friends and family. Equally beautifully packaged in a cranberry colored box with gold accents in an Indian-inspired design, tied with a white satin ribbon and an attached matching design "For You" tag. Each measures 3" wide x 2.25" tall and comes with one white tea light candle. This is the Good Luck Elephant Candle Holder by FashionCraft. It comes in a beautiful wrap box. You can see there are little gold specks on the box, to give it a nice design, and a little tag for you on there, a nice little ribbon that wraps up the box. Perfect for a wedding favor, for that Indian or Asian themed wedding. But since elephants symbolizes good luck, it's actually perfect for any wedding. And you open it up, and it's in a bubble wrap, and it's a beautiful elephant. You can see all of the intricate, colorful designs with little jewels at the end. Super cute elephant with a little tea candle right there, perfect wedding favor of very high quality for that perfect wedding of yours. I am planning to buy 40 pieces and delivered to Austin texas 78727. How much does it charge me ??? Ground is $29.63. You can find the ship costs by adding the items to your cart or using the Delivery Time tab below the description. At this time, Wedding Favors Unlimited ships only within the 48 contiguous United States. Do standard tea lights fit in the tea light holder? Yes, they hold a standard tea light. I wanted to check on a product Good luck elephant candle holder, how is this packed? These Good Luck Elephant Candle Holders are packaged in a cranberry colored box with gold accents in an Indian-inspired design, tied with a white satin ribbon. 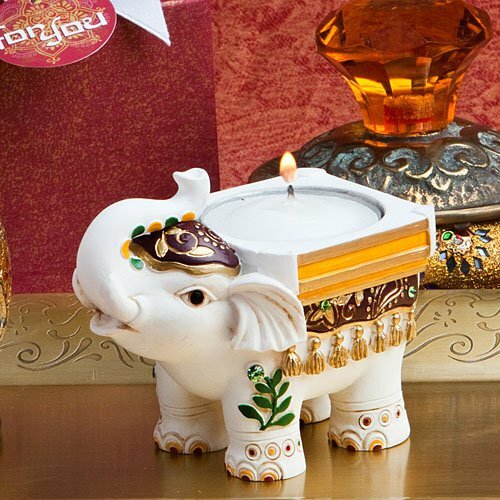 The Good Luck Elephant Candle Holder is made of an ivory colored poly resin material. Yes, it's recommend ordering 1 Favor (Sample) to make sure it will work for your needs.just enter 1 in the quantity box add to cart and then complete the check out. They are not meant to be used as a place card holder; there is not a place for a name card. I'm looking at the "good luck elephant candle holders." Can I get some discount if I buy around 70 pcs? Yes, if you buy 70 pieces the price goes down from $5.76 to $2.72. Most of our products are 20-40% below retail so you're really getting a great deal.